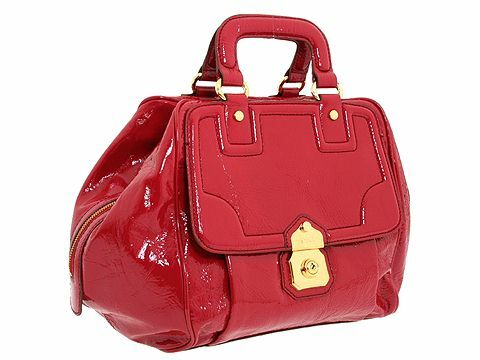 Drop dead gorgeous convertible handbag made of chic patent vinyl with bold hardware details. Holds your wallet, sunglasses, personal technology and a copy of your favorite magazine. Dimensions: 12 wide x 9 deep x 11 high. ; Dual handles with an attachable cross body chain. Handle drop: 2 3/4 length. Cross body drop: 20 length. Front exterior flap pocket with a push lock closure. Platform bottom. Top zip closure. Interior lining with a back wall zip pocket.